Wherever he went, men trembled, women swooned and small boys ran and hid behind their mother’s skirts, while secretly making promises to themselves that, one day, they too would be so feared and so respected. In fact, Guy de Rosillion was so feared and so respected that never once in his life had he been forced to draw his sword in anger – one glance from those steely blue eyes was enough to set the worst of ruffians to his heels and not even the most courageous of his fellow knights was prepared maintain eye contact let alone cross blades with him. Now, it happened that, one day, a dragon arrived in the countryside surrounding Rosillion. It was not a big dragon, as dragons go - being only the size of a decent elephant - but it was true to its nature - as dragons are – taking away sheep, goats, cattle and occasionally placing damsels in distress. So terrible was the dragon that, despite its reduced stature (in dragon terms) one glance from its smouldering eyes was enough cause anyone who saw it to flee in abject terror. Guy agreed and, together with his squire (a young man whose name has since been forgotten) rode out of the city gates one fine spring morning. His armour was polished, his sword sharp and his steely glint cowed all those who were foolish enough to look directly into his eyes. It is well known that dragons pay little attention to the affairs of men – much less, certainly, than men pay to the affairs of dragons – so that when the dragon saw Guy in all his polished splendour it did not tremble, swoon, take to its heels or, in fact, do anything that was expected of it, being totally unaware of Guy’s fearsome reputation. 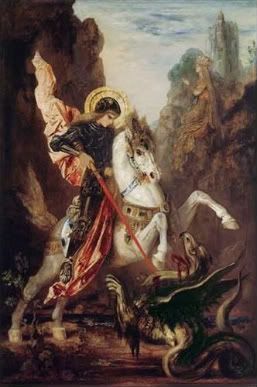 Instead, the knight dismounted from his horse and fixed the dragon with his steely glare. And in turn, the dragon ambled towards him and fixed Guy de Rossilion with its smouldering gaze. “No creature can withstand my stare,” thought Guy and glared even harder than before. “One glance and he will run like a frightened mouse,” thought the dragon (although this is a very rough translation from Dragonesque) and glared even harder. And as the squire watched from a conveniently safe distance behind a conveniently safe rock, something wondrous and utterly unexpected happened. Like the irresistible force and the immovable object, Guy and the little dragon simply cancelled one another out. They stood and stared, eyeball-to-eyeball, neither one moving or, indeed, capable of movement. After an hour or so, the squire slipped away and informed the good citizens of Rosillion of what had happened. In the end, they were unable to decide if this turn of events was to be celebrated or mourned (although, since they no longer had to concern themselves either the dragon or Guy, a slim majority thought the whole thing was for the best) and so the incident was discreetly forgotten about. So, if circumstance should take you to Rosillion and the countryside around it (the city still exists, somewhere just beyond the corner of one’s eye) and you should see a dragon and a knight locked in a staring contest, for pity’s sake do not be tempted to try and break their stalemate. They would not thank you for it. And neither, I believe, would anyone else. James Lecky is a theatre actor and director from Northern Ireland. Most recently, his work has appeared in Everyday Fiction and the Aeon Press anthology Emerald Eye. He lives with his wife, his cat and is sickeningly content. I think what fantasy tries to do - and for that matter all fiction - is to transport the reader, however briefly, into a different world and it is those different worlds and the characters that inhabit them that attract us to fantasy. A clever and ironic story that follows in the fairytale tradition. Charming...I enjoyed reading it.